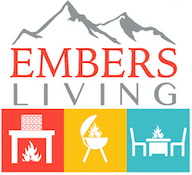 Buy wood fireplaces with Embers Living! If you are looking for a wood-burning fireplace to enhance your home, check out the vast selection at Embers Living. Our wood fireplaces offer a clean design and a wide viewing area to enhance any part of your home and are available in a variety of dimensions and styles for both indoor and outdoor use so that you can choose the one that will enhance the comfort of your home. So check out the selection of wood fireplaces and start shopping with us at Embers Living, today!